Halloween Costume Deals that are sure not to spook you this Fall. I know what you are thinking your kids are not even in school yet or at least just started how can I be thinking of Halloween. Well if you go into most retail stores right now they are slowly moving out the school supplies and bringing in fall and Halloween products. My rule usually is we have to get started in school before we can think of Halloween, because if you have followed my blog the last few years you will see we do a family theme and this takes a lot of planning. Not to mention I need to get through one anniversary and 3 birthdays before Oct. 2nd! We were chosen to review a Halloween Costume for Kids so I allowed my 9 year old to pick from the wide range of options from Wholesale Hallowen Costumes.com. I had purchased from them previously when I needed an costume for a birthday party theme and did not want to spend much. They kids costumes range from carrtoon characters to more gruesome Halloween themed costumes. My son was more than willing to try on his costume, especially since my daughter had a friend over at the time. When I ordered this Halloween Costume Deals, I did not realize it came with these fun finger additions. Not sure how they will stay on for trick or treating but love the affect. I was a little concerned about the mask but glad to find that it was backless. If we get a hot halloween night he will be thanking the manufacturer! It is simple velcro closure as is the vest. Well here is the costume in full gear. My dog was going a little crazy with the mask. I think it is authentic enough, especially as it runs under $30. 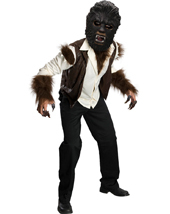 Don’t feel like you have to pay full price for costumes, give wholesale costumes.com a shot. They have adult and kids sizes so you can dress the entire gang. Also this is a great source to help stock those dress up boxes. There are manyHalloween Costume Deals choices under $20. What is your favorite Halloween Costume you have ever worn? Awesome. My favorite was either a snow white or witch. This year my kiddos are wanting easy which I love! oh wow that is cool. People are already talking about Halloween costumes, so it’s not too early for sure! I did buy some new Halloween decorations, early but they are out in stores. How awesome is this costume? Love how real it looks. I’m sure it’ll give his friends a scare come Halloween-time. I need to get a costume soon. Last year G was only 1 and we went out last minute and were lucky to find a pumpkin costume in her size. This year, I need to plan ahead. Thanks for sharing! What a great costume! We have already decided what our 16 month old will be now it’s just getting around to actually getting them costume! As my boyfriend would say it is never too early to think about Halloween. I need to start thinking about this too! Costumes can be so expensive so it is great to plan ahead!